Peter Moore, performance view of Lucinda Childs’s Egg Deal, 1963. Judson Memorial Church, New York, November 20, 1963. Center: Lucinda Childs. Sculptures: Charles Ross. That evening and some evenings after collectively became known as the Judson Dance Theater. The program was a signpost for both democracy and postmodernism, an unlikely pair. Probably it didn’t have much to do with either. Probably the wax of nostalgia obscures harsh realities. But it remains an attractive parable for how some brilliant young people made movements together, and how that togetherness waslike all togethernessesa tricky congregation of differences amid a sameness. This month, “Judson Dance Theater: The Work Is Never Done” opens at the Museum of Modern Art in New York. In honor of the occasion, Artforum invited art historian CATHERINE DAMMAN and writers DEBORAH JOWITT and CLAUDIA LA ROCCO to consider the performances’ influence and legacies. 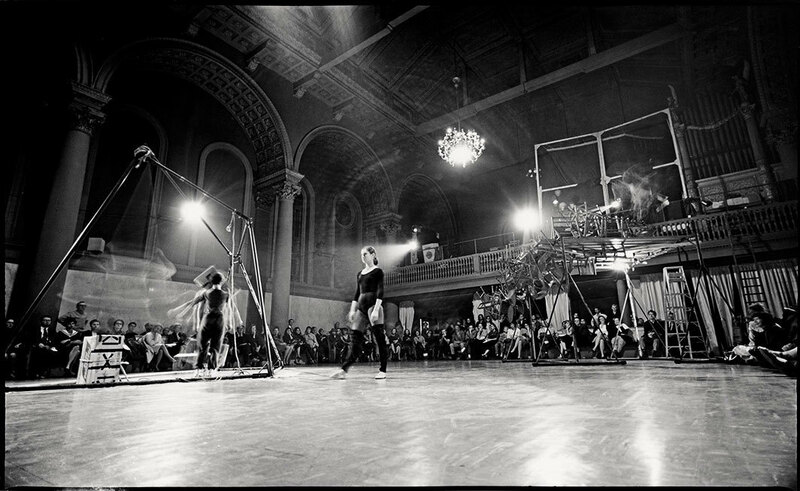 In addition, witnesses and participants DEBORAH HAY, BARBARA MOORE, STEVE PAXTON, YVONNE RAINER, DOROTHEA ROCKBURNE, CAROLEE SCHNEEMANN, and LA MONTE YOUNG reflect on the action and fill in the blanks regarding this historic series of events.